The development and history of 103 Callowhill Street, Philadelphia. Four years ago, Melissa created a blog entry on this page introducing the world to our latest project: a theater with an apartment above it. Even as she clicked "publish", it was with the understanding that this wasn't an effort to make a big splash - we were simply leaning on a familiar, easy-to-use tool to document as much as we could as we crash landed next to the Delaware waterfront. In between doing all the things we were doing, Melissa pushed beyond exhaustion to assemble photographs and stories about a story that seemed to grow exponentially every time turned through to each new chapter. But blogs and websites had, by 2015, been largely replaced by the new walled gardens of Social Media. But while these new age advertising giants masqueraded as communities, with record engagement across broad demographic spreads, people were also embracing a Frankenstein of Web 1.0 technologies like RSS and MP3, brewed together and filtered onto our handheld always-on internet comm devices: podcasts. Serial, arguably the series that truly introduced podcasting to the mainstream, was released the year before we started this blog. In the time since, several professional podcasting networks have self-assembled to assimilate this last vestige of the old internet, racing to build collections of content, or as an old co-worker at the York Newspaper Company once described it, "the stuff that goes around the ads." Those same media consumption devices could just as easily be utilized as media creation devices, and the rush was on to get a couple of friends to get together at the dining room table and talk in the general direction of a Macbook, in the hopes that sweet, sweet Squarespace and Caspar affiliate cash would play pilot to the Patreon flame. Celebrities and public radio defectors joined in, industry veterans turned their skills towards a new frontier, and with our cultural tacit acceptance of mobile surveillance, trackable advertising attribution is waking up the streaming music giants from their gluttonous sleep, with rumors of Spotify seeking to acquire Gimlet, the podcasting landscape is about to shift dramatically. 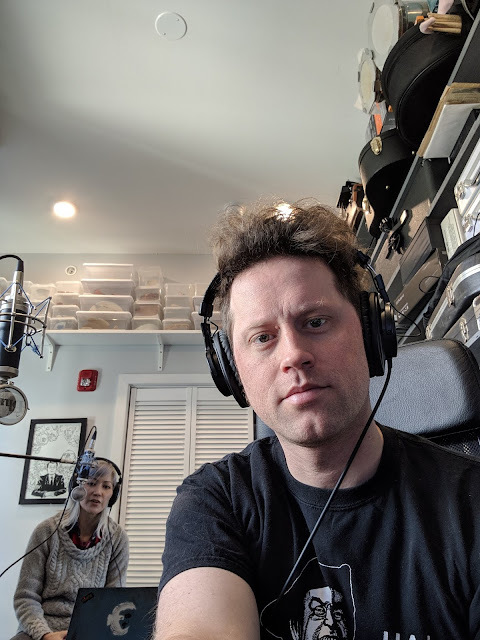 In the first weeks of this year, Melissa and I recorded three episodes of an idea she'd been talking about for a while now: a podcast about our adventures at the Hannah Callowhill Stage. We sat down and outlined a high level overview of exactly what it is we've been up to over the last five years, designated Sunday as Podcast Day, and on January 27th, released the beginnings of the story into the wild. The reaction has been humbling, and we haven't even got to the really good parts of the story yet. I don't think we're trying to catch the podcast wave, but at the rate of growth we're seeing, I'm not sure we have much choice in the matter. Our podcast is called The Boghouse - an old euphemism for a toilet, or outhouse, because a couple of privies that pre-date America changed our lives. We've had hundreds of conversations with friends, family, and strangers about how that came to be and about what's happened since, and we hope this podcast will provide a better record of that, and as a side effect, save our voices, so that instead of monopolizing people's times at parties, we can say, "Oh yeah, we've got a podcast all about it, check out The Boghouse on iTunes, Spotify, Stitcher, or Google Play Music." So check it out. If you like what you hear, do that thing all the podcasts tell you to do - rate us, like us, subscribe. We are planning to record on a weekly basis, and this is a finite series that follows a (somewhat non-linear) story arc, so you'll want to listen in order, starting with the first episode.